A dark, poignant, and emotionally brave coming-of-age memoir: the story of a young man who, by handling the dead, makes peace with the living. For almost twenty years I mistook my father’s downfall as my own. But it wasn’t. It was not my sister’s either, nor my mother’s. A literature professor at La Salle University, Andrew Meredith’s father was fired after unspecified allegations of sexual misconduct. It’s a transgression Andrew cannot forgive, for it brought about long-lasting familial despair. In the wake of the scandal, Andrew’s parents limp along, trapped in an unhappy marriage. Meanwhile, Andrew treads water, stuck in a kind of suspended adolescence—falling in and out of school, moving blindly from one half-hearted relationship to the next, slowly killing the nights drinking beer and listening to music with his childhood friends. Broke, Andrew moves back home to his childhood neighborhood in Northeast Philadelphia and takes a job alongside his father as a “remover,” the name for those unseen, unsung workers who take away the bodies of those who die at home. He describes, as only a professional can do, the intimate, horrific, poignant, and occasionally morbidly comedic aspects of handling the dead. Just how do you carry a 500-pound corpse down winding stairs? What actually happens to pacemakers, tooth fillings, surgical screws, artificial hips, and anything else that the deceased has within his or her body? Andrew begins to see his father not through the lens of a wronged and resentful child, but as a sympathetic, imperfect man who loves his family despite his flaws. Eventually the chip on his shoulder starts to lose its weight. 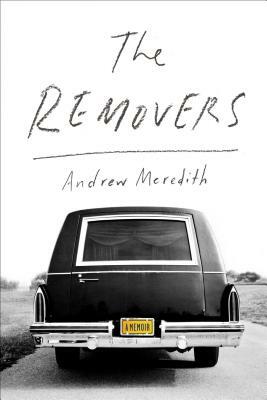 Poetic without being florid, and with the literary ability to transform the naturally grotesque into the exquisite, The Removers is a searing story of a young man who finds in death a redemptive path toward the forgiveness of the living, including himself. Andrew Meredith has been awarded fellowships from Yaddo and from the Fine Arts Work Center in Provincetown. He received an MFA in Fiction from UNC-Greensboro. The Removers is his first book. "Mr. Meredith knows how to make sentences and how to put them in service of paragraphs that broaden the emotional register of his narrative. The reader is edged, inevitably, up and back between the good laugh and good cry by his artful prose.... debut more worthy than most." "Powerful...Meredith writes with plainspoken grace and easy humor... Meredith meditates on failure and family with an honesty so raw it’s almost painful. What makes this memoir ultimately rewarding is its steadfast testimony of Meredith’s progress toward becoming the kind of man he wants to be. " "This book is good. It’s also gruesome, wryly humorous, beautiful and horrible, all at the same time.... So wrapped up was I in this book at that point that I realized I’d been holding my breath. That’s a sure sign of a good read and a good reason to look for this memoir. For anyone who relishes a shadowy coming-of-age story, “The Removers” is one you won’t be able to remove from your hands." "Flawless... With its lyrical language and strong sense of place The Removers is rollicking fun, even when what it's describing is ghastly - and with its East Coast-gothic backdrop, it practically begs to be translated into a film." "A darkly funny memoir about family reckonings." "Meredith’s memoir of how his life was affected by his father’s transgression is itself poetic, and he tucks his bittersweet childhood memories between tales of removals as carefully as the death certificates he slips between the bodies he picks up and the stretcher-like contraption that transports each body to the waiting vehicle." "Dark and bleak and funny and utterly Philly... a tour de force"
"This memoir is much more alive than the bodies it describes—rich in language and delicate in its portrayal of a son who suddenly sees his father as imperfect yet irredeemably human." "Poignant...bittersweet, but also frequently, improbably hilarious...This book will ring true to anyone who ever yearned to grow up, only to find that coming of age is more painful and beautiful than they ever imagined." "A coming-of-age memoir within a morbidly unconventional context."